Puck Connolly is different. She never meant to ride in the Scorpio Races. But fate hasn't given her much of a choice. So she enters the competition - the first girl ever to do so. She is in no way prepared for what is going to happen. As she did in her bestselling Shiver trilogy, author Maggie Stiefvater takes us to the breaking point, where both love and life meet their greatest obstacles, and only the strong of heart can survive. 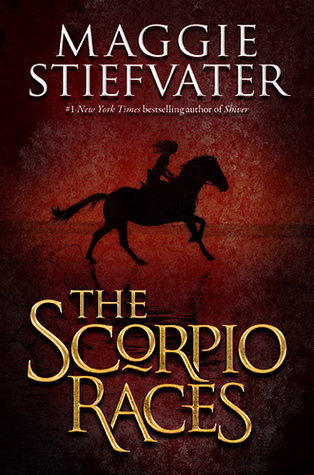 The Scorpio Races is an unforgettable reading experience. 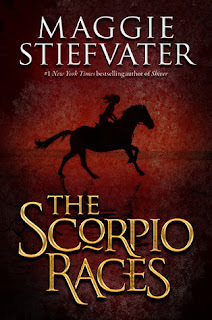 I have to admit that this ARC sat languishing on my BEA shelf for almost two full months before I picked it up, and then it was only because Maggie Stiefvater herself came to town and mentioned that The Scorpio Races is her favorite of the books she's written. How could I resist a plug like that? The book starts rather slow, and I probably would have given up (at least temporarily) had I been reading under different circumstances. However, I started reading Scorpio while waiting for Stiefvater to sign my books, and I was around #95 in line, so it was a decent amount of time. I found that by around page 80 I was familiar enough with the dual narrators to know who was talking without checking the chapter headings. Crossing that hurdle was, for whatever reason, the key to me enjoying the book. Scorpio has a completely different feel to it than the Mercy Falls series, which is probably another reason why I initially had a difficult time connecting with the characters and storyline. Once I did, though, I couldn't stop. This is a fantastic book!